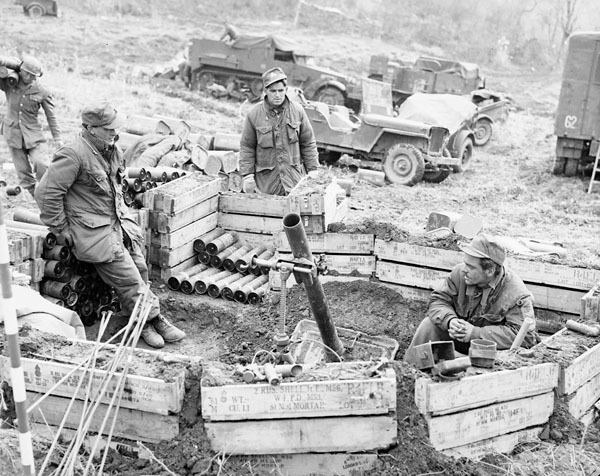 The Royal 22nd Regiment mortar platoon ready to fire, (left to right) Private Daniel Primeau, Private Raymond Romeo, and Private Julien Blondin, all of Montreal, Quebec. In 1951 the two sides established defensive positions around the 38th parallel. Canadians were often deployed on or near Hill 355, named by the military as it was 355 metres above sea level. The Hill, located about 40 kilometres north of Seoul, was known as “Kowang San” to the Koreans and was nicknamed “Little Gibraltar” by UN troops because of its prominent size and many defensive positions. It was the highest ground overlooking the surrounding front lines and supply routes and thus of strategic importance and the scene of fierce combat. On November 22, 1951, Canadian troops from the Royal Canadian Regiment, Princess Patricia’s Canadian Light Infantry and the Royal 22nd Regiment (nicknamed the “Van Doos”) were shifted to a new stretch of the front lines almost seven kilometres long that bordered on the American-held Hill 355. The Van Doos were just getting settled in their positions under the shadows of Hill 227 and Hill 355 when the Chinese began an intense bombardment. They held their ground until the Americans retook Hill 355 for good on November 25 and the communist attacks came to an end. On October 23, 1952 the Royal Canadian Regiment, stationed on the hill since early September, came under heavy artillery attack and a Chinese assault by a large raid against the Canadian positions. Some of the Canadians were forced to abandon their defensive positions. The UN forces counter-attacked and the Chinese withdrew. The Canadians succeeded in reoccupying the position in the early hours of October 24. Among the 18 Canadians killed, were four soldiers with connection to Nova Scotia with the 1st Battalion, Royal Canadian Regiment. Thirty-five Canadians were wounded and fourteen were taken prison. Stretcher bearer of an unidentified regiment of the 9th Canadian Infantry Brigade in the Normandy bridgehead, ca. 8-9 June 1944.